Prog rock legends Rush recently kicked off their mammoth 40th anniversary tour, and Hughes & Kettner is along for the ride in style. The band are using the tour to revisit the highlights of their four decades at the top of the rock ‘n’ roll business, and particularly the incredible growth they’ve achieved over the last ten years, with a show that’s as impressive to look at as it is sounding. 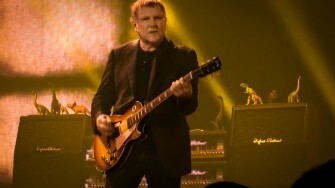 One part of these celebrations of the history of Rush involves guitarist/vocalist Alex Lifeson showcasing the different looks and rigs he’s rocked over the years, which is where Hughes & Kettner comes in. H&K formed a key part of Alex’s arsenal for years – he even had his own a signature TriAmp model – and so the Rush crew asked if H&K could supply the parts for a dummy TriAmp rig for the 40th anniversary tour set. Thanks to the TriAmp MKII Alex Lifeson model’s unique purple glow, the amps can be seen right to the back of the stadiums when Rush play classic tracks like Subdivisions. The TriAmp MKII Alex Lifeson is perfect for replicating those huge Rush rock tones, as is its successor, the new TriAmp Mark 3.